On this very cold winter day we have the perfect recipe for you! Sweet potatoes, butternut squash and other hearty vegetables are in season now and make the perfect base for warm wholesome soups. 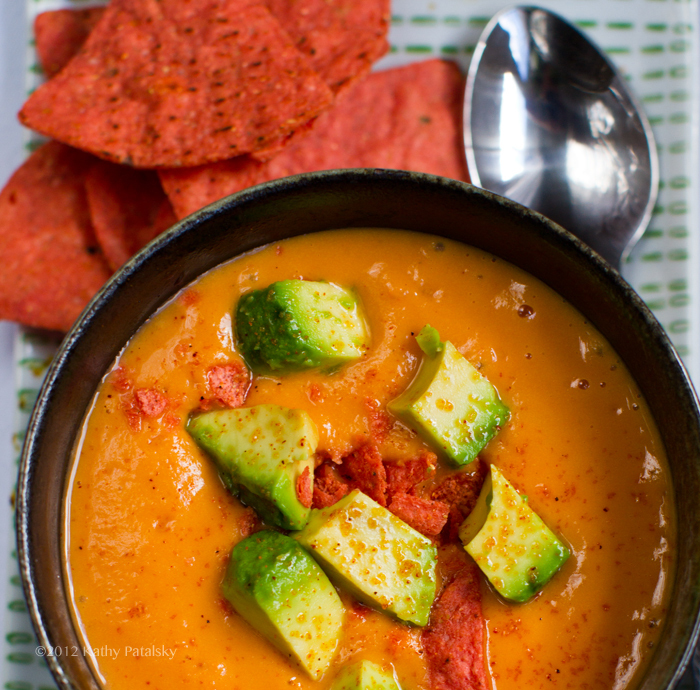 This chipotle sweet soup looks fantastic and we can’t wait to try it ourselves! lower sodium note: salt is very important for this recipe! It brings out all the flavors of the sweet potato base! If you need to go light on sodium, however, give lime or apple cider vinegar a try to perk things up..
2. Bake your sweet potato until tender. 3. Remove potato skin, add to blender along with the broth and non-dairy milk. Blend on low until smooth. Taste a drop to see that it is slightly bland at this point. Add the salt and spices to taste. I added the zest last and folded it into the poured soup. 4. Serve with garnish or avocado and crushed chips over top. also rich in potassium, manganese and B vitamins. note: The hot potato should warm the soup enough to be served as is – or you can warm on the stove or microwave until hot enough to suit your taste buds. Pumpkin or Butternut Squash Version: You can use the same recipe, subbing out the sweet potato. You may need less liquid to thin out this version of soup. You will need more salt since the pumpkin and squash are both very bland on their own. For more healthy and seasonal meals, follow La Prima and Catering by Seasons on Pinterest! We are always posting our own recipes and recipes from around the world, so stay tuned!